You are here: Home / Visio Content / Shapes / Easy Music Note Paper with the Smart Staff Shape! Easy Music Note Paper with the Smart Staff Shape! I’ve been playing around with Visio and music notation, very slowly, for some time now. Here’s my first offering: a Smart Staff shape that you easily configure with clef and key. 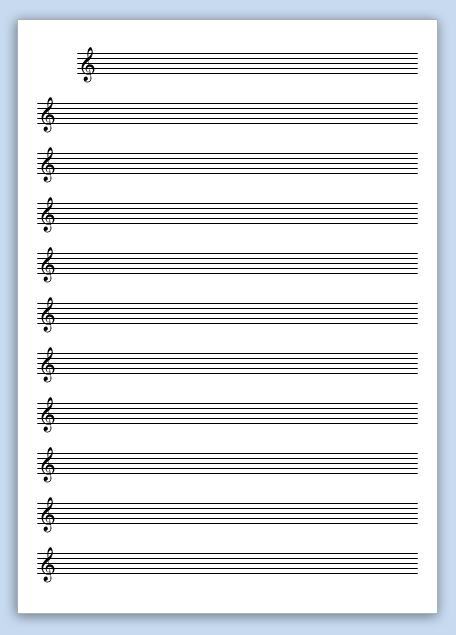 You can use it to print out music note paper or illustrate bits of music theory in other documents. My interest in music theory has been growing lately. There are several reasons for this. Since orchestral trombone parts are often dull, I like to mess around with trumpet parts, which are written in treble clef, and transposed to B-flat (whatever that means). Trombones typically read non-transposed, Bass clef, which makes our lives easy and allows more time for beer. But occasionally, we like a challenge too. When my (very cute) 19-month-old daughter wakes up in the morning, her hair is messy and curly. It reminds me of Beethoven or some other mad composer. This sets me in the mood to invent songs in the U-Bahn on the way to work. Since I work with Microsoft Visio so much, it seemed a good idea to combine the two interests. 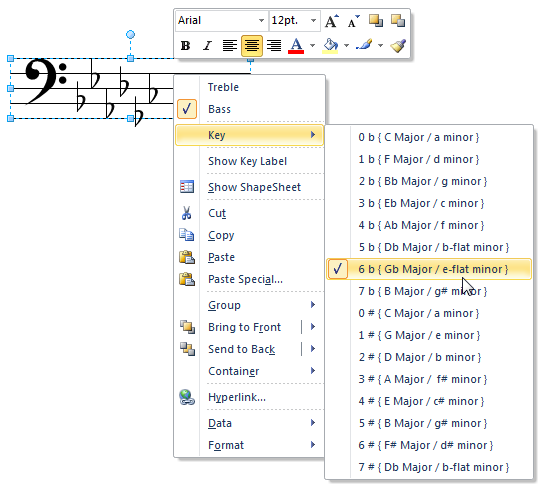 I don’t think Visio will ever be a practical music-notation editing system, but it could be used for light mark up, instructional illustration, and printing blank sheets of music note ledger paper. If you’re misfortunate enough to have heard of the Circle of Fifths, you’ll know that there is an eerie system to the way sharps and flats materialize on the musical staff for Western music. Mother Nature at her most mysterious. 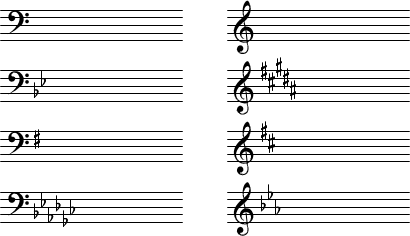 All the major and minor keys contain from 0 to 7 sharps or flats. A limited world with a set number of parameters. Perfect fodder for a Visio SmartShape! So I built what I call a Smart Staff. 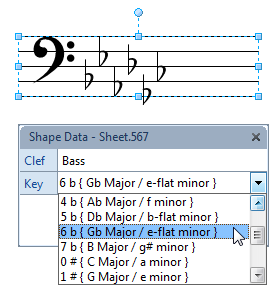 A single Visio shape that contains a clef sign, and the appropriate number of sharps or flats. You only need to set two parameters to get the signature you need! Note: the cascading Key menu shown above will only show up in Visio 2010 or later. Earlier versions probably show as a single, long menu, although I haven’t checked it. If you choose the Show Key Label item, then your chosen key will display as text to the left of the shape. You can easily move the text by pulling on the little yellow control handle in the middle of the text block. 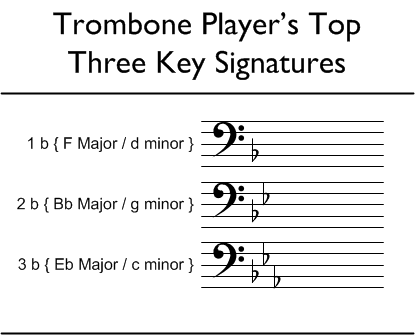 This is great if you are illustrating key signatures for yourself or for students. In the Shape Data window, change the values for Clef and Key. All staff shapes should change at the same time! No time for a free giveaway to add tenor and alto clefs. I must say that I encounter tenor very seldom, even though I typically play fairly high notes. Nice tool, thank-you. Have been thinking about musical arrangements in Visio for a while. Now, coming across your work, I see that I can “centre-drop” your SmartStaffs into larger Visio page-sizes, add chord/note icons, and finally fan out related musical arrangement notes (or visual arrangement cues) around the perimeter. Are you by chance working on building something like SmartMusicalNotes, to connect/glue to your Staffs? I’ve got some shapes somewhere that I started fiddling with. You can move the notes up and down, and they snap to the staff lines automatically, and add extra ledger lines as needed. I don’t think I got as far as making half, quarter, eight, sixteenth nodes, though. This gets tricky because of runs vs. single, dotted value notes, etc. Unfortunately, I don’t have the time to do much in the near future. This is a really nice shape and a great way to produce a staff when you need one and can’t locate music paper. If you do more than a little bit of music, you would probably be better advised to use a proper “engraver” program (which is like a word processor for music that enforces good musical layout rules). There are some lower-end “learning” packages which don’t have all the features, and some Free open source engravers for all platforms which automate following of the layout rules, lyrics under the staves etc. I played with MuseScore a bit and was quite astounded at what you could get for free. I still feel like that for quick notation mock-ups, Visio has potential. Armed with a good, usable set of shapes, and keyboard shortcuts for panning, zooming and duplicating, you can move quite rapidly. But there’s no playback, no automatic overflow onto the next line, etc. Hey Chris!! Oh, sorry, Ludwig! Very nice. 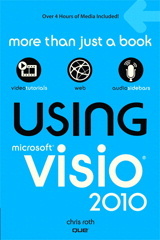 I happened across your site because I’m looking for some Visio solutions for some clients. Nice to see some trombone stuff on a Visio page. Great that you are still playing. You might not recognize me by may married name, so I’ll sign this with the name you know me by from high school. I used my Surface Pro in big band rehearsal the other day, it worked fantastically! Hi Chris! Started reading your adventure with Surface and bookmarked it for later. I have an Asus Windows 8.1 tablet (the “real” Windows, not the Metro/Modern-only). I just got another tablet, an iPad Air, because I legitimately need it for an Accessibility class I’m teaching. I haven’t had the guts to take only the tablet with me on trips – freezing issues (the screen, not the temperature). I’m hoping the next upgrade to Windows 10 might fix that. One big purpose of mine is to have charts on my tablets. I guess that’s in the rest of your story, which I’ll have to finish tomorrow *yawn*. Anyway, the Sony DPT-S1 is going to have really great battery life, but it needs ambient light, like real paper. It is quite expensive–it just got *reduced* to US$900 I think–but printing out all those charts costs money and takes a lot of time as well. Here’s one video review of it: Sony DPT-S1 vs Microsoft Surface Pro 3 – PDF Editing and Viewing. I’ve only seen one music-related comment about this thing, and the guy said it was too slow at page turning, and you couldn’t hook a USB pedal/page-turning device into it. But I think that guy was a piano player and probably had LOTS of notes and pages, whereas trombone charts for big band are probably 1-3 pages, so maybe it’s less of an issue. 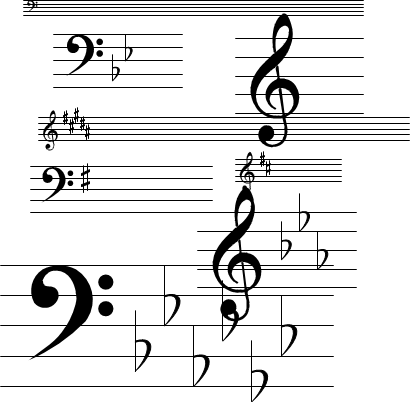 Love your music notation pages. 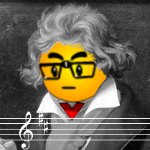 I was hoping you’d added Alto and Tenor clef in the years since I first downloaded your SmartStaff template, as my kids have taken up strings, and Viola uses Alto clef. …and I just bought an alto trombone too! But I mostly read bass clef anyway. I just haven’t had the time to expand this thing, although I’ve wanted to for a long time.